Every week, our staff will handpick a game from the past two weeks that we believe is a must-have download for your iPhone or iPad. These games will always be from a wide variety of genres, but they are chosen because our own staff members love it and can’t quite put it down. So here are this week’s picks! Enjoy, and happy gaming! Take on the role of an AutoBird and run and gun your way through the pesky DeceptiHogs in our Game of the Week. Do you still enjoy Angry Birds and Transformers? 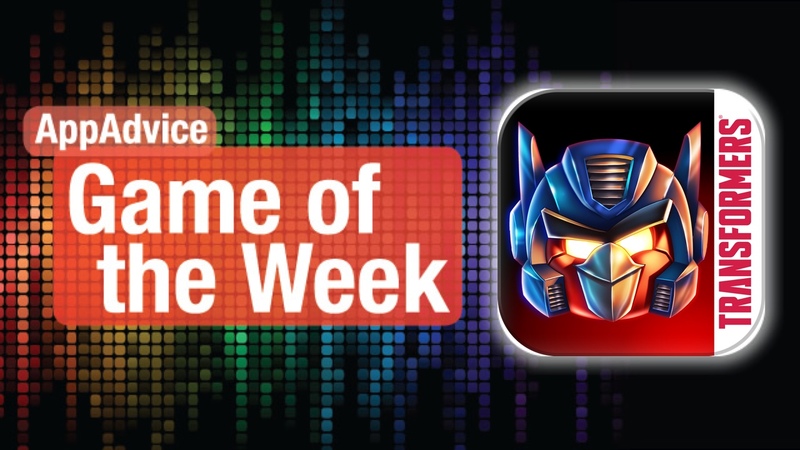 Then our Game of the Week will be sure to delight: Angry Birds Transformers. While it seems that the Angry Birds phenomenon has died down a bit from a few years ago, they’re still around but have taken brand new forms, as demonstrated here. Rather than go with the traditional physics-based puzzle game of the other Angry Birds installments, Transformers is a 3-D shoot ’em up adventure game. You will take the role of the Autobirds as they run and gun down the Deceptihogs, who stand in their way of the EggBots, which are eggs that have been transformed into robots by the EggSpark. Sounds just like the movies, doesn’t it? The game features bright and vibrant 3-D graphics that are detailed and look great on Retina screens. The soundtrack is catchy and fun, which is going to be great to help get you in the mood for gunning down those darn Deceptihogs. 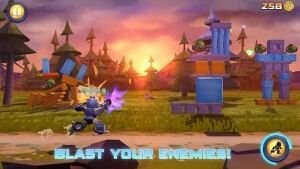 Angry Birds Transformers features a large roster of heroes and villains that you can play as, all with their own unique attacks and abilities. Each character can also transform into a vehicle, including car, truck, tank, or plane, in order to dodge falling hazards that will hurt otherwise. 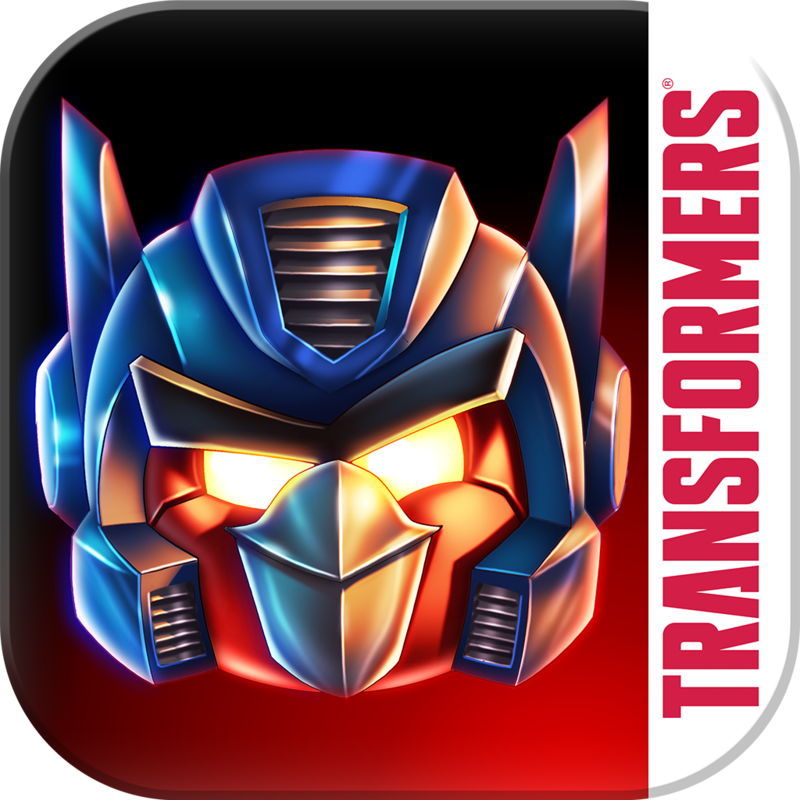 As you play, you will earn money that can be used to get upgrades for your Transformer, making them stronger and have awesome new skills. There is also the social aspect of the game, where you can borrow a friend’s character for a tag team attack, which is always fun to watch unfold. We’ve been enjoying Angry Birds Transformers over the past few days, and if you are a fan of the Angry Birds or Transformers series, then this mashup is worth checking out. You can get it on the App Store as a universal download for free. For more information, check out our original article. Line up for victory in Terra Battle. A title that I thought deserves more attention this week is Terra Battle, our Honorable Mention of the week. This is the latest strategy RPG game from Mistwalker Corporation, founded by Hironobu Sakaguchi, who created the Final Fantasy game series. The artwork in this game is superb, and should make any fan of JRPGs (especially Final Fantasy fans, as you may see some familiar faces) feel right at home. All of the character art is beautiful and detailed, and the animations are nice and smooth. The adventurous soundtrack will help set the mood, and the sound effects are fun to hear. Terra Battle is level based, and you’ll have to go through the stages in order, but you can replay them at any time. Each game will cost a certain amount of stamina, but this recharges over time. In addition to the normal levels, there are special events that can take place for bonus experience or coins, so keep an eye out for those! The levels will consist of a grid, and you will have to go up against several waves of enemies, and even a boss in the final stage of a chapter. You can have up to six characters in your party at a time (multiple setups are allowed in the menu), and everyone takes up a square on the board. 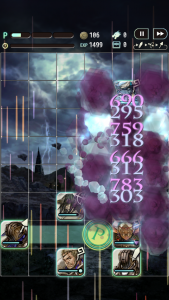 Numbers on enemy tiles indicate how many more turns until they move or attack — you use up a turn by moving one of your characters around. In order to attack enemies, you need to line them up so they can flank an enemy. If there are other team members lined in up the row or grid, you will deal more damage. The “P” icon gives your attacks a boost if you line up with it. Each character has a weapon type: sword, bow, spear, or spellcaster. The spellcasters can be healers, recovery types, or deal elemental damage. You’ll need to use the strengths and weaknesses of each weapon type and element to your advantage in battle. Players are awarded with coins after each battle, and sometimes you can earn a new character or items used to upgrade heroes for better jobs. The coins can be used towards improving existing characters, or you can spend them in the tavern to recruit to your team. There is also energy that you can use to recruit legendary heroes. I’ve been loving Terra Battle for the past week, and have been playing it every day since I first downloaded it. It’s an incredible strategy RPG, and the freemium part is done very well. I recommend checking it out if you haven’t already. 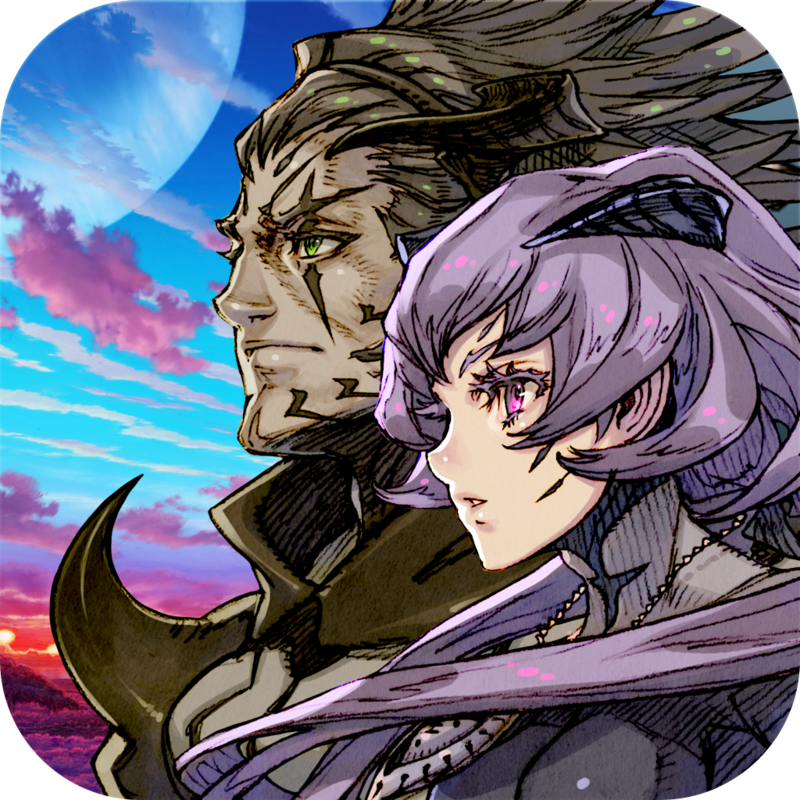 You can find Terra Battle on the App Store as a universal download for free. For more information on Terra Battle, don’t miss my full review.